A dragon perches on the top of a pierced Gothic tower while his mother watches from below in this stunning incense burner. 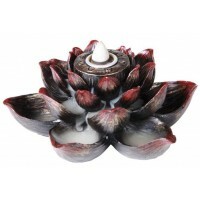 Beautifully detailed and fit for any castle, this gorgeous incense burner is designed for cone incense. Lift off pierced top reveals the compartment beneath. We suggest filling it part way with sand or salt to absorb the heat - you can also use the piercing to hold stick incense. 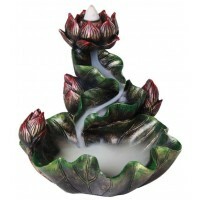 Gray stone look hand painted resin dragon incense burner is 11 inches tall. Item Number: PT-10647 | Approximate Size (Inches): 5.45 wide x 5.45 deep x 11.00 high | Approximate Shipping Weight: 3.00 lbs.